A warm welcome awaits you at Carrigeen Castle, in Butler Family ownership since 1919. Mrs Peig Butler has been operating a Bed and Breakfast in her home since May 1976 and, as such, is one of the most experienced operatives in the Irish hospitality sector. Her son, David, assists her when free of academic teaching duties at University College Cork and University of Limerick, where he coordinates the Diploma in Genealogy and the Certificate in History of Family, respectively. 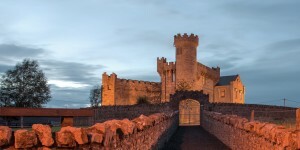 A 5-minute walk from the town of Cahir, Carrigeen Castle provides a historic setting for bed and breakfast rooms in County Tipperary. Free on-site parking is available at this 16th-century castle. Tradtionally styled rooms have views of the mountains and gardens, and include a wardrobe and flat-screen TV. Bathroom facilities include a shower, hairdryer and complimentary toiletries. Breakfast is served each morning. Guests can also make use of a lounge and library, and explore the spacious grounds. The pretty riverside town of Cahir has many traditional Irish pubs, restaurants and cafés, and Cahir Castle is around 5 minutes’ walk away. Tipperary is a 20-minute drive, and you can reach the city of Waterford in just over 1 hour and Cork in around 50 minutes.